September 21 — St. Matthew, Apostle - Feast - My Catholic Life! People leave their jobs for all sorts of reasons. Better pay, more opportunity, a shorter commute. Today’s saint left for a better boss. Matthew was at work in the city of Capernaum, a bustling town with a customs house. It was just another day, and Matthew was going about his job of collecting taxes. Nearby Jesus was doing his job too, curing a paralyzed man. It was an ordinary day for both of them. But after performing His miracle, Jesus walked down the main street of Capernaum, saw Matthew outside of the customs house, and then the normal day ended. Jesus said to Matthew, simply, directly, and with force, “Follow me.” And then something astonishing happened. Matthew followed Him. Fistfuls of Roman coins may have spilled from his hands, he may have swallowed a gulp in his throat, quickly adjusted his sandals, and then scurried to walk in the small clouds of dust that puffed up behind Jesus every time His feet slapped the dry dirt. In an instant, Matthew’s life had changed forever and always. He had become a follower, a joiner, of the most important man in the history of the world. The Gospel of Matthew nowhere mentions that it is written by a man named Matthew. But it was attributed to him very early in the life of the Church. It was compiled by 80 A.D., at the latest. Matthew’s Gospel is clearly written by a Jew and for Jews. It references the Old Testament repeatedly and notes how Jesus fulfilled those ancient Scriptures. Matthew’s Gospel is the only one which identifies him as a tax collector. Mark and Luke refer to him as Levi, which may have been his birth name, while Matthew (“gift of Yahweh”) was his post-conversion name. Because it begins with a genealogy, Matthew’s Gospel, but not Matthew himself, is represented by a man, or at least by a man’s face. After his big moment in Capernaum, Matthew’s name consistently appears in the Gospels’ lists of Apostles, but little more is said about him, apart from a feast he hosts in honor of Jesus. It is not known where he evangelized, or where or how he died. Four churches in France alone claim to have Matthew’s head, so it is likely that no one has his head. Christ passes by in every life. Everyone has their chance to say yes or no, to stay or follow, to change or remain the same. That moment may come only once and never return. Sudden callings, and sudden conversions, are rare, but they do happen. A life is more likely to plot slowly upward on a graph than take a sharp right angle either up or down. Matthew’s life angled when his line intersected with Christ’s. 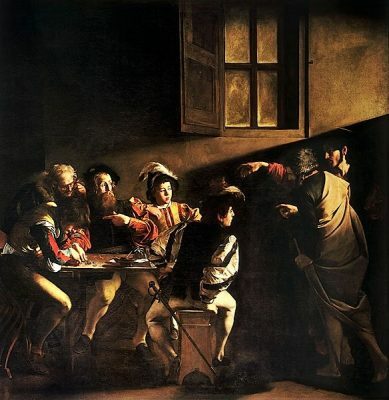 The moment is captured in all its drama by the painter Caravaggio in his Calling of Saint Matthew. A broad shaft of light beams through the room from above Christ’s head. His bony hand points to a well-dressed man at a table with his fingers on a pile of coins. The scene unfolds not in the street, but in a darkened room. Light and darkness play. Sin and virtue tussle. Past, present, and future hang in the balance. Christ seems to say, “Will you take and eat, will you go and sell, will you come and follow me?” Difficult, challenging questions. But Matthew gave the difficult, generous answer in response, and we remember him today due to that one moment. Saint Matthew, you made the right decision at the right time, and so changed your life and those of millions of others who know Christ because of you. Help us to recognize when a pivot point arrives in our own life, when we must change direction, and help us to choose that direction well. ONE day, as Our Lord was walking by the Sea of Galilee, He saw, sitting at the receipt of custom, Matthew the publican, whose business it was to collect the taxes from the people for their Roman masters. Jesus said to him, “Follow Me;” and leaving all, Matthew arose and followed Him. Now the publicans were abhorred by the Jews as enemies of their country, outcasts, and notorious sinners, who enriched themselves by extortion and fraud. No Pharisee would sit with one at table. Our Saviour alone had compassion for them. So St. Matthew made a great feast, to which he invited Jesus and His disciples, with a number of these publicans, who henceforth began eagerly to listen to Him. It was then, in answer to the murmurs of the Pharisees, that He said, “They that are in health need not the physician. I have not come to call the just, but sinners to penance.” After the Ascension, St. Matthew remained some years in Judæa, and there wrote his gospel, to teach his countrymen that Jesus was their true Lord and King, foretold by the prophets. St. Matthew afterward preached the Faith far and wide, and is said to have finished his course in Parthia.